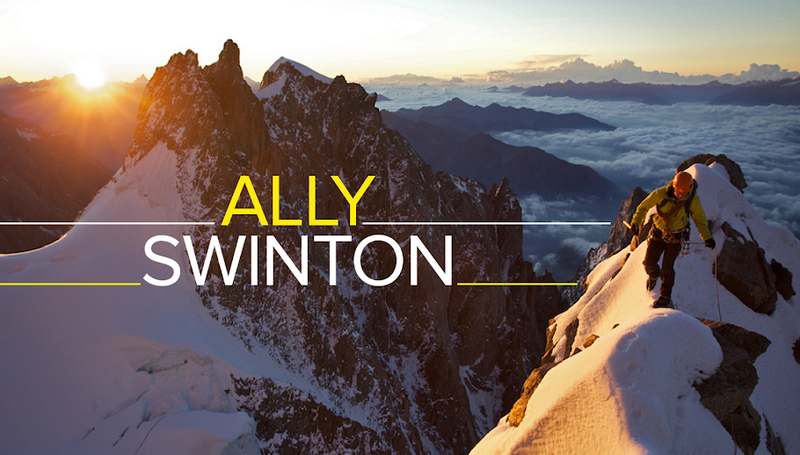 ally swinton blog: Going out to play! I find it funny how as a child we didn't think about things too much, we played! We'd spend hours just messing around and not have a care in the world. It's what made us tick. One of the biggest things we all probably did as a child was run. Whether it'd be a game of tig, hidey, playing football, getting a chase from someone or kicking around a plastic bottle and shooting it between two jumpers for goalposts. We just ran for hours and didn't think too much about it. 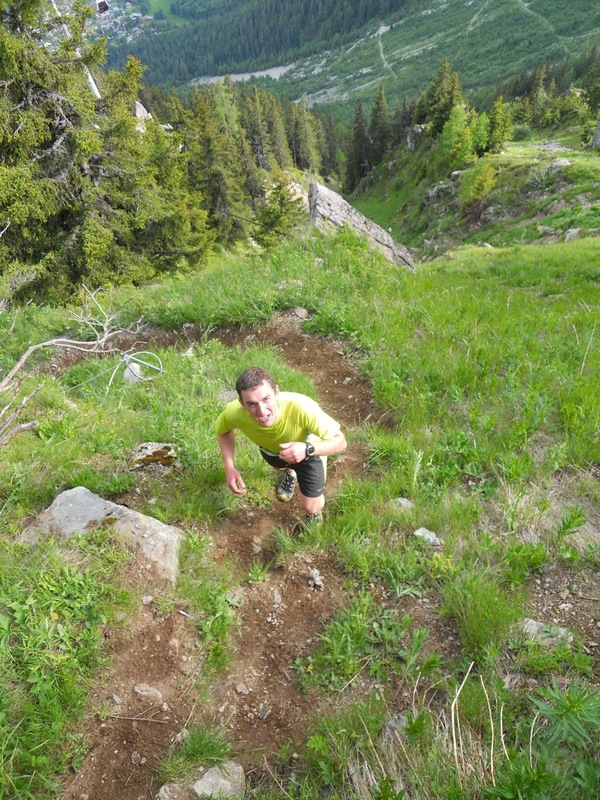 At the end of the Winter season I got really inspired to do more running this summer, so I started doing bits of running as the snow left the valley floor. However I stupidly ran too hard too soon and managed to give myself minor shin splints. So this set me back a little, which was a shame as I had gotten really excited about the running and entered a few races for the year. To stay fit and to keep the legs strong I got on the road bike, knowing that this won't irritate my shins. I have never been a strong long distance runner but it's defiantly something I want to become a lot stronger at. I'm much better at the up's. 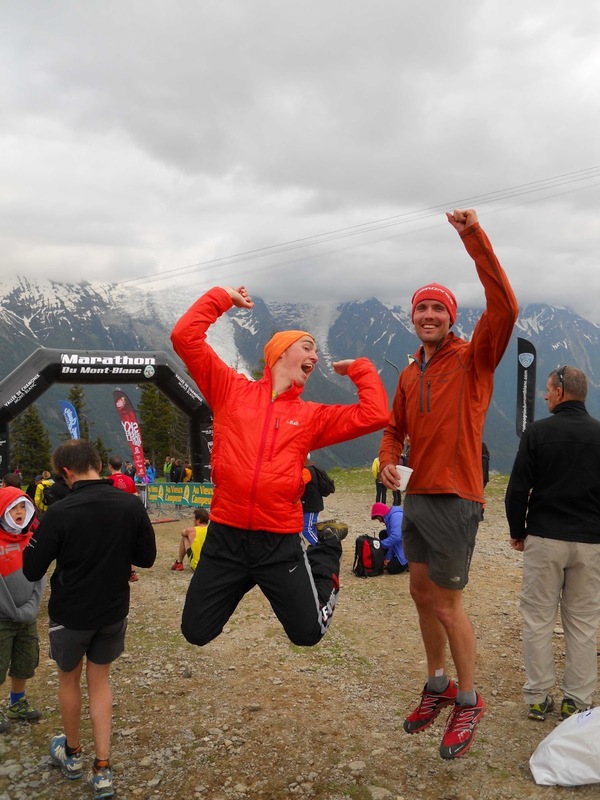 On the last weekend of June the Mont Blanc marathon was on, which hosts a number of different races to suit everyone's taste. I had entered the vertical Kilometre race, which was to be my first ever running race. It's a track that zig-zags it's way up the hillside below the Brevant bubbles. 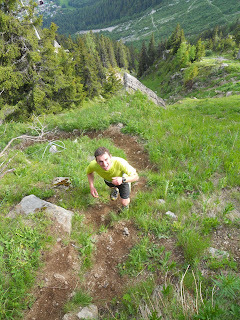 I've ran the trail many times before as it's a perfect training slope for the mountains. Your pretty much always on your toes the whole way up, which gets the calves and hamstring going. Plus it's also brilliant for learning how to pace yourself. I didn't feel ubber strong for the race, and was in Vall dell'Orcco for 4 days of crack climbing and eating piazza. However I really just felt so open about the race I had no expectations, I had ran it many times so I knew I'd get up it at least.. I was actually quite excited by it, and really enjoyed the whole experience. Which is a feeling I want to take with me for every race I enter. Trying to tell if I'd be back in time for tea! Felt rubbish going up the road, but managed to smile for the camera. 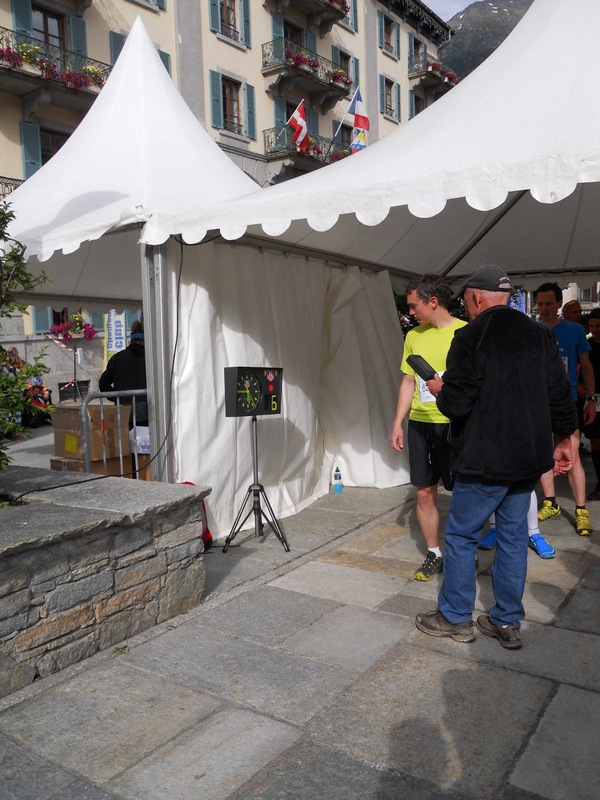 When you enter the race you have to give a predicted time, which I estimated at around 50mins. I had a quick warm-up and then rushed down to the starting line for 16:00. Which was the starting time on the website, no other details. However I found this board with everyone's name at starting time on it and I was on at 17:45! I met up with Ally Hurst who was also running and also starting around the same time as me. We had a grumble about how this info should be on the website before hand. So we left the start line at sat in Misha's house, drinking tea and eating biscuits! Time actually went past quick and Ally gave me a quick shout that I'd be starting in 5mins! We rushed down to the starting line dumped our bags that would be taking up to the top. Then I got in line until the counted me down to start running. On the zig, or the zag! Pic taken from the bubbles. Cheers Emily. 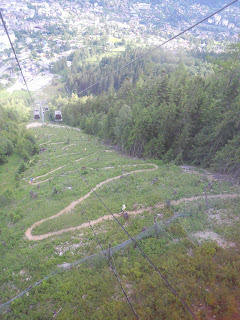 Almost at the station platform. I hated running up the steep tarmac road that takes you to the start of the trail, but once on the trail I just went into automatic mode and paced it quite well up the lower sections. My predicted time worked out well as I passed a few people near the bottom and had most of the middle section to myself. It wasn't until the upper parts where it steepens up that I was stuck behind a few people, as it's a single track with no possibilities to overtake.. It's ok at first as it forces you to slow down which allows you to get your breathe back, but then soon enough your wanting past. Everyone is generally pretty good with letting others past though, so works out well as a race. How every race should finish.. 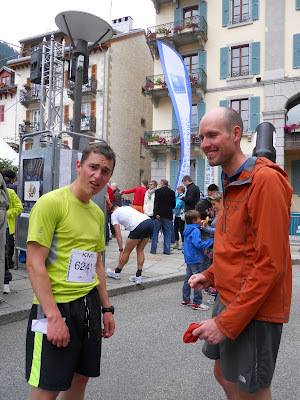 I had entered the 'Tour des Fiz' which is a race that runs around the Rocher du fiz, just outside Chamonix. It is 64km long and has 5300m ascent in it. Unfortunately though small niggles of injuries came back on me and I decided not to take part. This is one I'll love to do though. The next race I have coming up is the Rab Mountain Marathon in the Lake District on the 28/29th of September. It's a 2 day race where you have to navigate and carry your own tent, sleeping bags and food for the 2 days! Then head straight down to the pub afterwards. Can't wait! I'm running it with Colin Thornton, who spends more time on the trails than in his house. He's going for the Leadville 100 in the States next week. I just hope that he can use a compass for our race! So maybe we've all focussed our 'playing' into specific areas, but I've got two jerseys if anyone fancies a 'kick aboot'? yeah I seen that your back into the running again. Wow your covering some distance. I need to focus on distance a bit more. Most things are just 'up' around here.